Your big move is almost here! Amid the excitement, and yes, a bit of chaos, the reality of packing strikes. One look at your closet and you panic. How in the world are you going to get all of those clothes packed? Here are a few tips to get you started. Packing up your clothes may seem like something that can be done without much fanfare, but the fact remains that you will need a few supplies like, boxes, suitcases, tape, and so on. Be sure to gather your supplies (get more than you think you’ll need), before you begin. That way you won’t have to stop in the middle of the job to go get more boxes. How long do you have to move? If you have several weeks, you may be tempted to wait to pack up your closet. Don’t procrastinate. The sooner you can get this job done, the faster you can move onto the next one — and that will make the entire moving process much less stressful. Set a schedule for packing everything, including your family’s clothes. For instance, maybe you leave mornings from 9-10:30 free for clothes packing until the job is complete. Or dedicate an entire day to getting everyone’s clothes packed up! Now is not the time to hang onto outdated, stained, or ripped clothing items. If you haven’t worn in it two years (or it no longer fits), then it must go! 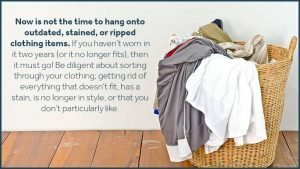 Be diligent about sorting through your clothing; getting rid of everything that doesn’t fit, has a stain, is no longer in style, or that you don’t particularly like. 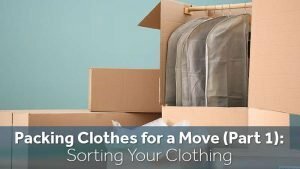 One of the wisest ways to pack (and unpack) clothing is to sort items by season. That way you can unpack just what your family needs when you reach your new home; leaving off-season items to unpack another time. Be sure to mark boxes so that you can easily find what you need after. Packing is hard enough, but trying to find an outfit to wear to work when those boxes are piled all over the house can be even more stressful. Take advantage of suitcases by packing a few days’ worth of clothing (including undergarments and sleepwear) in your family suitcases. That way you will have instant access to what the entire family needs until you get those clothing boxes unpacked. Moving shouldn’t be stressful. Zippy Shell Greater Columbus offers the convenience of packing at your own pace by bringing storage shells right to your front door. Simply pack your items when you have time and then Zippy Shell will take them to your new location for you. To find out about monthly specials, contact us at Zippy Shell Greater Columbus today.